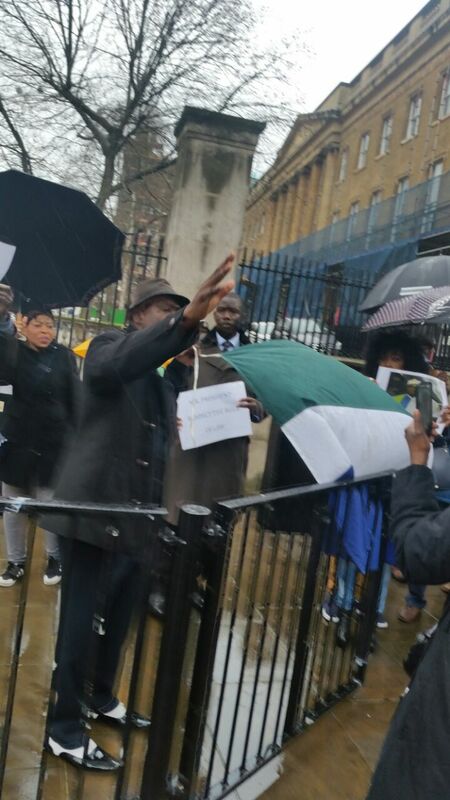 This morning, concerned Sierra Leoneans in the UK, held a protest march outside Downing Street – official home of the British prime minister, in central London. I joined the protest because to my mind the removal of an elected Vice President from office, as Sam Sumana was, poses grave consequence for the future development of our fledgling democracy and institutions. 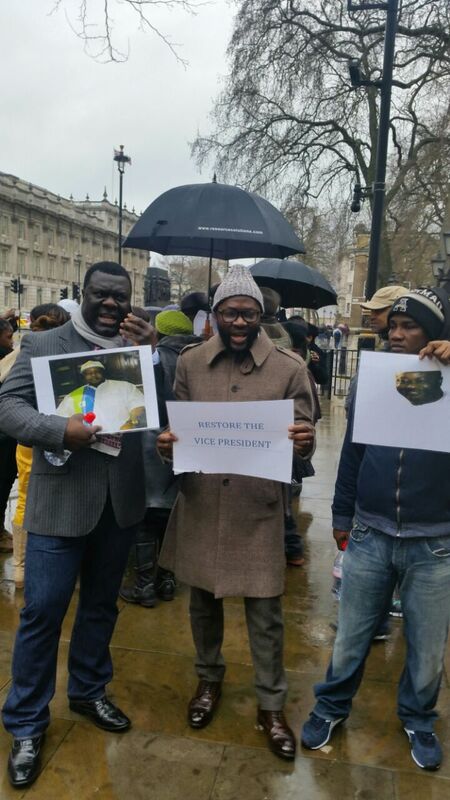 However, the protest revealed the level of apathy and indifference among Sierra Leoneans here in the UK to the political turmoil in Sierra Leone. The protest in Central London and only a stone’s throw away from the Boroughs of Southwark and Lambeth, which have strong Sierra Leonean population, did not attract more than 60 people. It is reasonable to suggest that if the level of patriotism was sufficiently high, this protest should have attracted a lot more people, even if we allowed for participation or non-participation based on political party affiliation and sympathy. 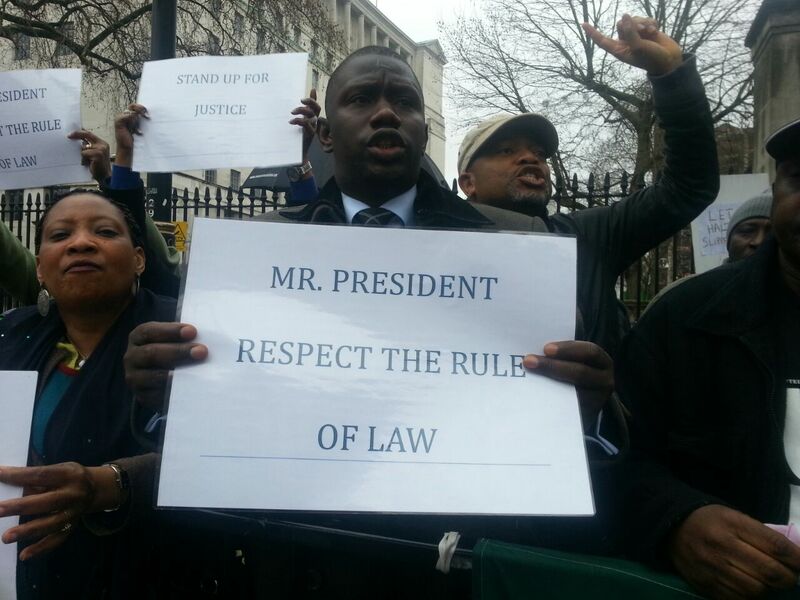 There are significant numbers of qualified and practicing Sierra Leonean lawyers in the UK, who should have been at the demonstration today, to show common cause with their brave Sierra Leonean counterparts who have denounced the President’s action. The constitutional issues that President Koroma’s actions give rise to are legal issues, and it is reasonable to expect that if this professional group were sufficiently interested and, or engaged, that they would also have been at the helm of the protest today. As the protest got under way, I could not help thinking that President Koroma and his cabal would easily form the view that they can continue to chip away at bits of the constitution that are at odds with their political agenda, safe in the knowledge that the vast majority of Sierra Leoneans will acquiesce, if they are not fully in support of their actions. We have been here before. During the 1970s and the 1980s, the foundation of our current state of under-development was constructed by the APC. We looked the other way as the APC systematically destroyed the rule of law, democracy, civic and political institutions – including local government, trade unions, press, political parties, chieftaincy, military, police, private sector, university institutions, etc., either through being co-opted into a corrupt political process or through our collective acquiescence. Evil prevails where good men and women are silent. The Sierra Leone Telegraph understands that the event was very poorly publicised, and that not sufficient time was given to allow people to make plans and arrangements to be at the event. The editor of the Sierra Leone Telegraph was in London on Friday, 27th March, and heard nothing about plans to hold this event. I am not surprised that the demonstrations in London were so poorly attended. Firstly, the weather in London was very wet and windy last Sunday and very few people would brave such cold conditions for a political demonstrations. 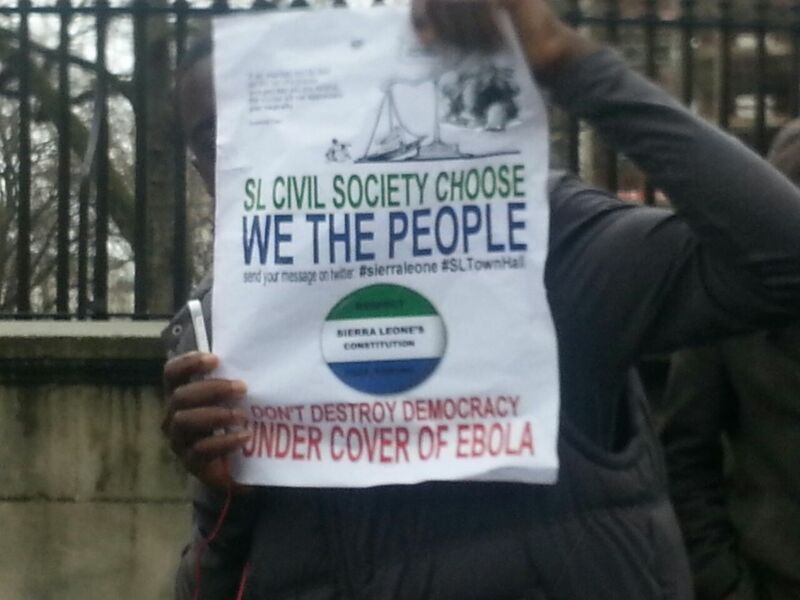 Secondly, most Sierra Leoneans in London do not believe that these demonstrations are genuine. They believe that there is a hidden agenda. The Constitution is not the main objective of those who organised the meet, but ‘looking after their own man’ i.e. Sam Sumana. They are more interested in seeing their tribesman Sumana back in power. People believe that there are a lot of underlying tribalistic sentiments, rather than the simple pursuit of constitutional rights. We need to keep focus on the fact that Sam Sumana who is just as bad as his ex-boss Koroma, is not the issue here. Most people believe that he is insignificant in this constitutional crisis. The important issue is for the Supreme Court to decide whether Ernest Koroma acted constitutionally or not. what happens to Sumana after the verdict is insignificant and irrelevant, I do hope he does not grace the corridors of State House ever again. He should now focus on arriving in the US to answer to those very serious corruption and theft charges, levied against him by two American businessmen he had duped of hundreds of thousands of dollars. Sumana and his ex-mafia boss Koroma, have done irreparable damage to the international image of our motherland. Both must leave public office and never to return.